Few of the world’s ecosystems have been left untouched by humans. While we can restore many ecosystems damaged by people to their historic function, some may be beyond repair and have become “novel ecosystems.” According to experts at the Society for Ecological Restoration (SER) conference in Madison, Wisconsin, some 36 percent of the globe’s ecosystems are now novel, meaning that more are now novel than wild. Some goods news though: the maximum extent of novelty, around 50 percent, was reached around 100 years ago. The percentage of novel ecosystems has actually gone down with more intensive agricultural practices that take up less land. Ecologist Eric Higgs, University of Victoria, put novel systems in a broader context. Walking through Southern Vancouver Island, he has seen many invasive species from elsewhere, but has been puzzled about what to do. There’s a limited amount of energy for pulling out every invasive plant species, particularly in areas totally over-run. Even if plants are removed, “the system will revert back immediately” to a state of invasion. At the global level, land use and climate shifts, invasive plant invasions, nitrogen deposition, and cultural changes mean a constant struggle against novelty. In the face of this overwhelming struggle against novelty, there has been a shift in values among society. Years ago, restoration ecologists wanted to restore ecosystems to their “historic fidelity” as much as possible. Now, ecologists, scientists, and landscape architects discuss the value of novel ecosystems’ services, which to some extent are plant-agnostic. Mike Perring, University of Western Australia, seeks to quantify the extent of novel ecosystems across the globe. He said “novelty is not new,” so he’s trying to figure out the current and historical extent and how things have changed over time. Perring and his team have used “proxies” such as land-use maps and population counts. Areas used by humans and close-by areas not used are basically novel. In addition, areas previously used but no longer used, areas where there was “population in the past,” will sometimes still be novel. While there are different land-use models, Perring estimated that a vast amount of the globe has been converted for human use, meaning about 36 percent of the world’s ecosystems are novel. Excluding the ice-covered parts of the planet, this means that more of the planet is novel than wild. According to the models Perring used, there has been lots of change over the past 250-500 years. “The wild has been going down over time.” But the good news may be the novel is going down, too. The maximum amount of novelty, around 50 percent, was hit around 100 years ago. Novelty has gone down as humans have cultivated land more intensively. Perring wondered whether we have reached irreversible thresholds of novelty or not, as well. With ozone, carbon dioxide, and acidification levels changing with climate shifts, there are definite implications for ecosystems. According to Brian Starzomski, University of Victoria, all ecosystems, even novel ones, are rapidly changing with climate shifts. “You basically need to move 110 meters per year to follow your climate.” Climate shifts are expected to only accelerate, further exacerbating challenges related to novel ecosystem management. 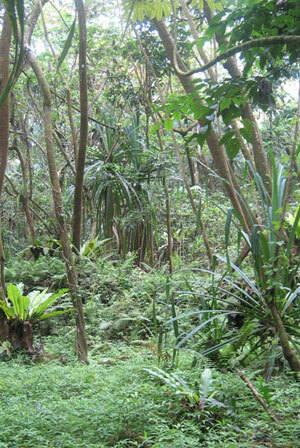 Image credits: Novel Ecosystem in Hawaii / Image credit: Emma Marris, ASLA Interview. Sea levels are projected to rise dramatically over the next century, impacting coastal infrastructure that was never designed for these new conditions. In the face of this change, simply maintaining the status quo is an implausible prospect. At the Society for Ecological Restoration (SER) conference in Madison, Wisconsin, a set of landscape architects and ecologists proposed ecological strategies for adapting to sea level rise. By harnessing previously ignored or repressed ecological systems, coastal settlements can more effectively respond to their changing landscapes. Kristina Hill, Affiliate ASLA, a landscape architecture professor at the University of California, Berkeley, discussed strategies for beach restoration in the context of rising seas. Using Virginia Beach as a case study, she explored the potential of the Dutch zandmotor (or sand motor) method of beach restoration (see image above). Virginia Beach claims to have the longest recreational beach in the world, and, therefore, an economic impetus to keep its beach in a static, predictable form, requiring periodic restoration work. Traditionally, beach restoration work, which was last completed in Virginia Beach in 2002, involves dumping large amounts of new sand on the shoreline and spreading it around with a bulldozer. This process is expensive and highly disruptive to beach ecology. 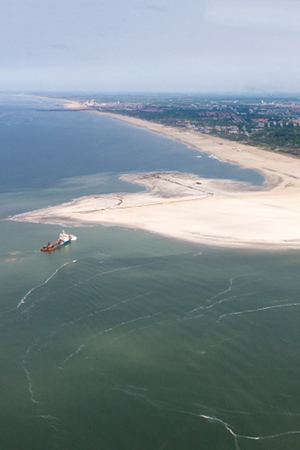 The zandmotor method involves harnessing wave action to distribute sand across the shoreline. Instead of applying sand directly to the beach with bulldozers, sand is dumped offshore. Over time, coastal currents move the sand and deposit it along the beach. This method is much cheaper and less disruptive than traditional beach restoration. Next, Shimrit Perkol-Finkel, SeArc – Ecological Marine Consulting LTD, spoke about retrofitting existing coastal infrastructure to support diverse marine ecosystems. Perkol-Finkel described how much existing construction consists of smooth concrete, a material that is not hospitable to marine growth. As an alternative to traditional concrete, she proposed the development of ecologically-active infrastructure that enhances ecological systems without compromising function. Enhanced biological buildup, including the proliferation of oysters and corals, can actually enhance the strength and durability of this infrastructure. Speculating that concrete’s poor ecological performance has to do with its alkaline composition and smooth texture, Perkol-Finkel discussed a series of experiments with alternate concrete mixtures and arrangements. 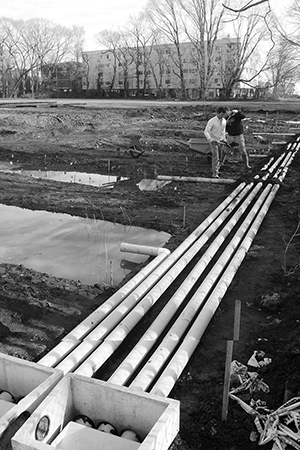 These experiments, which took place both in the lab and in the field, revealed that some concrete mixes perform significantly better ecologically than others. 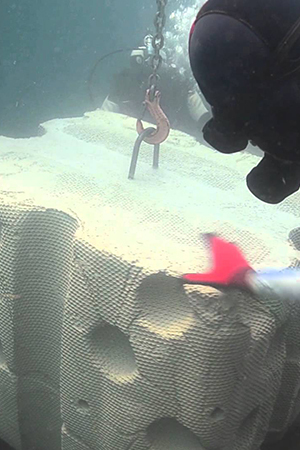 Furthermore, textured concretes proved to be far more conducive to marine life than smooth concretes. Slight modifications to the composition, texture, and design of marine infrastructure can lead to an enhanced ability to attract flora and fauna. This translates to an infrastructure that is biologically active, contributing to both ecological health and infrastructural function. Peter Hummel, Anchor QEA, discussed strategies for integrating ecological restoration and infrastructure in Puget Sound. Much of the degradation to Puget Sound’s ecosystems has come not only from encroaching development, but also from coastal infrastructure itself. Using examples from rural, suburban, and urban settings, he presented case studies where coastal infrastructure was reconnected to ecological systems, enhancing resiliency to sea level change. Whidbey Island in Puget Sound was given as a rural case study. Historically, the 600-acre site consisted of tidal marshes and mudflats. Most of this was lost with the introduction of a dyke and pump station, as well as a state highway and navel base. Recognizing that the pump station is extremely expensive to maintain, the restoration plan involves the wholesale removal of the levee and the replacement of the state highway with a bridge. By removing everything that limits the site’s hydrology, these modifications allow natural processes to rebuilt marshland – a process-based restoration plan. 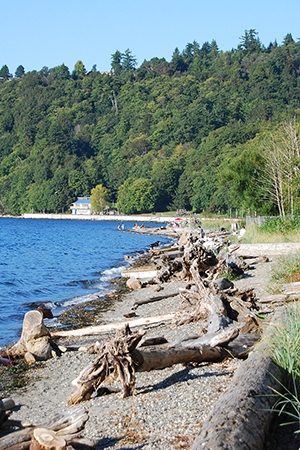 Similarly, restoration efforts in Seahurst Park, a suburban setting, involve the removal of hard infrastructure to allow natural processes to function. In this case, a series of bulkheads have prevented landslide material from reaching the park’s beach, piling up uselessly only to be eventually hauled away by trucks. As a consequence, the beach has lowered 3 – 4 feet over 30 years. The restoration plan for the site involves the removal of these bulkheads, allowing landslide debris to reach the beach and rebuilt it over time. In all of these examples, ecological processes are integrated into traditionally hard coastal infrastructures, benefiting both marine ecosystems and infrastructure. As sea levels rise, finding creative ways of harnessing ecological processes will be critical to coastal resiliency. This guest post is by Ben Wellington, Master’s of Landscape architecture graduate, Louisiana State University and ASLA 2012 summer intern. The American Society of Landscape Architects (ASLA) yesterday filed a legal challenge to a claim of sole ownership of the Sustainable Sites Initiative (SITES) trademarks by the Lady Bird Johnson Wildflower Center (WC) at the University of Texas at Austin (UT). The petition, filed in the District Court of Travis County, Texas, seeks declaratory rulings and a court order requiring that trademark filings by UT be withdrawn. Although the partners—ASLA, WC, and the U.S. Botanic Garden (USBG)—have worked together productively over the years, a dispute over SITES’ trademarks arose earlier this year. Despite joint development of the trademarks and the parties’ oft-stated joint ownership of all SITES intellectual property, UT took it upon itself to file applications for registration of the trademarks in the name of the University of Texas Board of Regents. This unilateral action was undertaken over the strenuous objection of ASLA. Upon being pressed for the basis for its action, UT has taken the position that it is the sole and exclusive owner of the trademarks. This assertion is factually and legally wrong and cannot stand. In an effort to avoid legal action, ASLA has made numerous attempts to resolve the issue with the Wildflower Center and UT leadership and legal counsel. However, UT has refused to withdraw the trademark filings and reconsider its claim of sole ownership. The Sustainable Sites Initiative has the potential to affect a significant market transformation and inspire a new, collective ethic of environmental stewardship in land planning, design, construction, and maintenance. We particularly regret this unfortunate distraction as the SITES project is now at a pivotal moment in its development, with the release of SITES v2 and the beginning of open project certification scheduled for later this year. ASLA is committed to working on the SITES project in partnership with the Wildflower Center and U.S. Botanic Garden. However, we cannot accept the improper trademark filings or UT’s claim of sole and exclusive ownership of property that rightfully belongs to the SITES members, jointly. A copy of the ASLA filing can be read online. 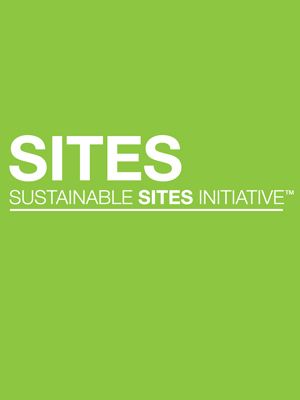 The Sustainable Sites Initiative is dedicated to fostering resiliency and transforming land development and management practices towards regenerative design. The SITES Rating System is a voluntary set of guidelines and performance benchmarks to assess the planning, design, construction, and maintenance of sustainable landscapes. The central message of SITES is that any landscape holds the potential to both improve and regenerate the natural benefits and services provided by ecosystems in their undeveloped state. To date, 23 projects have received certification under a pilot program, and some 60 are continuing to work towards that goal. With the release of the new guide, anyone will be able to pursue certification. We regret the need to take this action. We look forward to a quick resolution and a successful rollout of SITEs v2. The Rich Legacy of Frederick Law Olmsted Jr.
Laurie Olin, FASLA, founder of OLIN Studio and recent recipient of the National Medal of Arts, gave the keynote speech at the symposium, Frederick Law Olmsted, Jr.: Inspirations for the 21st Century, held at the National Building Museum in Washington, D.C. 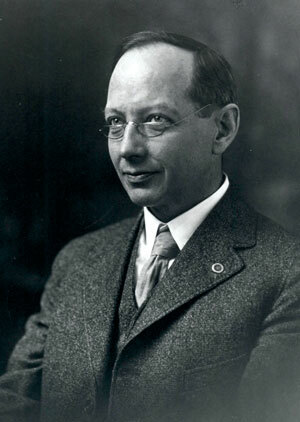 Presented by the National Association for Olmsted Parks (NAOP) and its partners, including the American Society of Landscape Architects (ASLA), the symposium was the first of two parts that, together, will be the most comprehensive presentation to date of Frederick Law Olmsted Jr.’s amazing legacy. Olin’s point of view is a “practitioner’s” but also “someone trying to teach people to become landscape architects,” referring to his work as practice professor of landscape architecture at the University of Pennsylvania and former chair of the department of landscape architecture at Harvard University. In his talk, Olin didn’t take the bird’s-eye view of the younger Olmsted’s legacy, but provided a more detailed narrative about his formative years and the interests and forces that gathered in his work and thought. The overview began with the father, Frederick Law Olmsted Sr., who was “justly credited” with “initiating the field of landscape architecture.” The son, Olmsted Jr., “continued this activity” as it was “conceived and formed by his father” through the work of the family firm that he inherited with his older half brother, John Charles Olmsted. Omsted Jr. was “in large part truly responsible for the “development and recognition of landscape architecture as a profession” and was a “progressive reformer” at heart. He also was responsible for the “rapid evolution” of the study of landscape architecture and was a “central figure in the initiation and development” of the field of urban planning, the National Park Service, and ASLA. Frederick Law Olmsted Jr.: A Vision for the American West, will take place March 27-28, 2014 at Stanford University. This second event will expand the D.C. discussion to incorporate issues specific to the American West, including land and water conservation, state and regional parks systems, and protecting the region’s unique environmental resources. This guest post is by Karen Grajales, ASLA Public Relations Manager. Landscape architecture and ecological restoration are really different disciplines, but increasingly these fields are working together in fascinating ways. In a session at the Society for Ecological Restoration (SER) conference in Madison, Wisconsin, Rutgers ecologist Steven Handel organized a group of landscape architects and restoration ecologists to discuss why collaboration is vital. In a mutual lovefest, the ecologists explained how landscape architects are important to work with because they communicate well with clients and communities. The landscape architects argued that ecologists are critical to making the new wildlife habitats that form sustainable landscapes actually work and measuring their success over time. 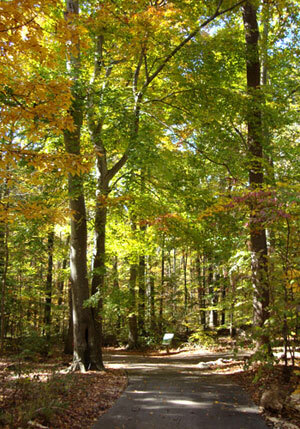 At the Fernbank Forest, which is a remnant oak, hickory, and pine forest long-protected from agriculture and development, landscape architects and ecologists are now restoring the landscape while improving access for educational purposes. Kaunzinger said the forest is actually in pretty good shape given there are no “soil disturbances.” There’s a lot of decaying wood, which is great for biodiversity. The stream heads are intact. There’s a protective fence and bikes are not permitted. The primary issue is the forest, which is near a county school district, is plagued by invasive plants from nearby residential areas. The goal of the design and ecological restoration efforts are to “restore, protect, and preserve the forest and campus, while enhancing ecosystem services, connecting the campus to the forest physically and programatically.” The team is working in some nice elements: bioswales on the campus, an elevated walkway into the forest along with a new forest boardwalk to protect the existing ecosystem, as well as an improved stream corridor. Ponds will have softer, greener edges to improve access. Where possible, all those invasives will be taken out. 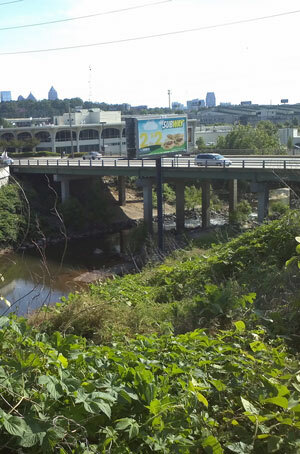 Another project Stainback is working on in Atlanta is the Peachtree Creek Restoration Greenway, a massive project involving landscape architects, ecologists, and other scientists that aims to help Atlanta rediscover this 30-mile-long creek. Stainback said the project is about “re-balancing natural systems and urban revitalization.” Most people only see glimpses of the creek and then see it as a “dangerous, neglected place overrun with invasive plants.” In fact, it’s a “beatiful riparian system” hidden in plain sight. The creek itself provided paths used by Native Americans for hundreds of years. To prove this, Stainback showed a set of beautiful artifacts from this important cultural landscape. Later, she said, European settlers copied the Native Americans and overlaid railroads on many of these old trails. Today, the creek itself is largely intact, with the flood plain soils in place. But the “lowlands” need to be further protected, and stormwater runoff is affecting the creek so new green infrastructure systems need to be put in. The restoration project has a few key goals. One is that nature takes precedence over the built environment. 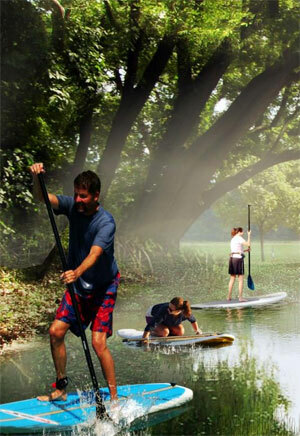 Another is to establish the creek corridor as a place for people to truly immerse themselves in nature. Trails will be designed to “maximize the aesthetics of walking in a native urban oasis.” Trail crossings will lie lightly on the land, with bridge and boardwalks. Around the restored creek corridor low-cost green infrastructure will be added to keep runoff from impacting water quality. Lastly, way-finding and educational signage will help bring people in, explaining how these kind of trails improve the health of communities. Johnson made some observations about the “nature of collaboration.” She said studies of chimpanzees give us some insights into human cooperation, namely that collaboration best happens when there is a “novel or complex problem with no standard, pre-existing solution” and there’s an “urgent need to find a solution.” She said how to create climate-resilient landscape in NYC is just one such problem. 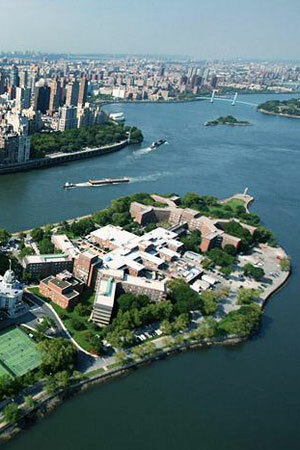 In one part of Randall’s Island, the hard edge, the sea-wall of stone that circles the island was crumbling. Storms have over-topped it too many times. The team found that a new, soft-edged natural shore-line was needed to respond to rising sea levels without collapsing. The prototype landscape they created couldn’t just work for scientists though, it also had to communicate the changing relationship with nature to the public. “How can we deal with sea level rise in a non-threatening way?” The idea was to explore city-friendly “natural flooding” but in a place where there was no critical infrastructure nearby, and then apply the model elsewhere. The design team came up with a new concept, at least for NYC — man-made “cusp beaches.” A “sacrificial berm” was built inland that will be “deliberately allowed to erode.” The berm will feed the beach in the winter, allowing for a “seasonal exchange of sediment.” A set of terraces was also created, reusing the old sea wall stones. Diverse coastal plantings were set within the terraced levels. 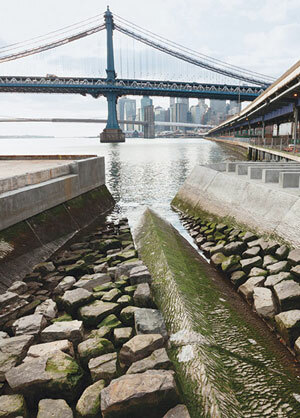 As sea levels rise, plants will “inwardly migrate.” Johnson said there will be fixed 5- and 7-feet marks set within the landscape so the NYC parks department can actually track movement of the water. Johnson said this experiment showed that “landscape architects are very well-endowed to organize collaborative teams,” but other disciplines clearly bring a lot of knowledge and expertise landscape architects just don’t have. Thanks to the chimpanzees for evolving collaborative behavior and getting us to this point. Another fascinating project shows what happens when landscape architects and ecologists collaborate on a master plan. In this case, both disciplines worked together to create one of the most innovative new plans we’ve seen in a while, for a revamped Water Works Park in Des Moines. 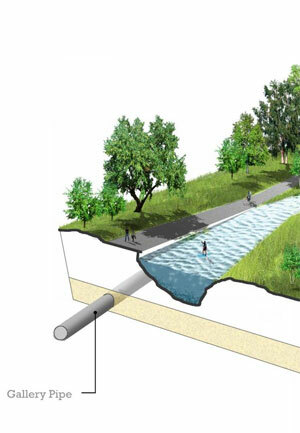 Kim Chapman, an ecologist with Applied Ecological Services, and Mike Bell, ASLA, a landscape architect with RDG Planning & Design, explained how water will be used to restore an ecological system and update a park. New ponds are being created, connecting them in a “circuit” for recreation. This will help reduce nitrogen in the water. The landscape around the ponds will be restored. Both of their firms are working with lead design firm Sasaki Associates, which won an international design competition for the master planning project. Their collective goal is to “embed local ecology in the community through planning and landscape architecture.” The project will eventually cost more than $25 million. The Raccoon River that runs through this part of Iowa is heavily polluted. Excess nitrogen comes off miles and miles of farmland, and then moves into the 1,500-acre Water Works Park. Chapman asked, “How can we address the problem of nitrogen?” A filter is expensive. The park is under-utilized. Why not put the water and landscape to use? The new ponds will help reduce nitrogen load. “The park will have low-nitrogen water.” The plan also reduces habitat fragmentation in the natural landscape of the park, while creating an “engineered landscape” for recreation — with the added benefit of strengthening the existing freshwater conveyance system under the existing ponds. Underneath the ponds is a “gallery,” a pipe 20 feet below the aquifer, a sort of “horizontal well” miles long. When it was first built in the 1800s, the gallery was made of wood. Now, an enlarged one made of concrete is being further extended under newly-built ponds. Chapman said the “volume of water in the gallery will be increased due to the pressure from the additional water,” an added benefit. Bell said Water Works Park really is saving the community money. 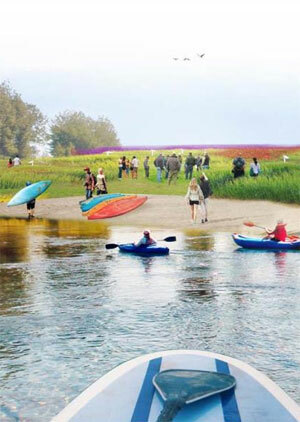 “It’s an ecological system so we don’t have to turn on the largest nitrate removal system in the world, which is in Des Moines.” This multi-functional engineered park, with its man-made ponds, will also feature spots for tents, fishing, scenic picnic areas, and canoe launches. How Can We Ethically Design with Nature? With the line between human and natural environments becoming increasingly blurred, how can we ethically design with ecological systems? 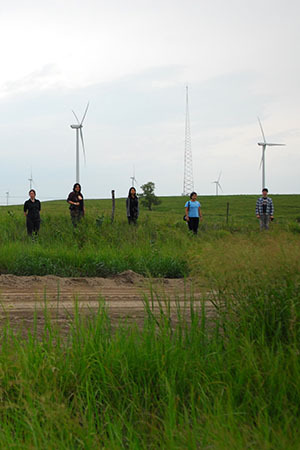 One session at the Society for Ecological Restoration‘s conference in Madison, Wisconsin, examined the ethics of ecological restoration and human interventions in nature. Ben Minteer, Global Institute of Sustainability, Arizona State University, described the tension between two seemingly opposed views on human agency in nature – preservationism and pragmatism. Preservationists have long advocated wild, “pristine” landscapes as holding moral value. Therefore, human intervention in nature should be minimized, except to return landscapes to some kind of historical baseline. In recent years, this philosophy has come under fire as being impractical and simplistic. 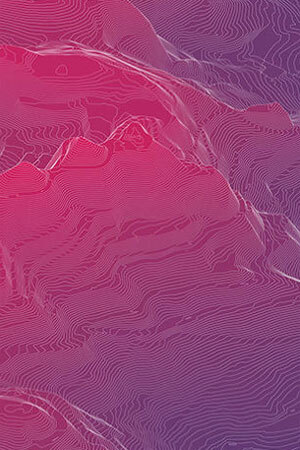 After all, historical baselines can be arbitrary and difficult to establish, and many landscapes have been altered to a point that they have no natural analog. Minteer described how new, anthropocentric approaches to nature call for an abandonment of idealized notions of pristine wilderness. According this view – pragmatism – human intervention should aim to enhance ecosystem services instead of attempting to restore to a certain point in history. But he also cautioned that this approach, where humans have complete control over nature, could promote reckless interventionism. Instead, Minteer advocated a middle ground between preservationism and pragmatism – a “pragmatic preservationism.” In this view, humans’ interventions in nature are equally weighted with an ethical responsibility toward the land. Eric Higgs, University of Victoria, also advocated a middle ground for ecological restoration, worrying about what he viewed as the risk of reckless intervention. Higgs described a spectrum of restoration challenges, from pristine landscapes (historically continuous ecosystems) to radically altered landscapes (novel ecosystems). He defined ecosystems that fall between these extremes as “hybrid.” According to Higgs, a responsible attitude toward restoration involves restoring hybrid ecosystems to historical baselines whenever possible, while still recognizing that many ecosystems may be altered beyond a threshold where this is possible. Ecological restoration then uses history more as a guide than as a template. Like Minteer, Higgs stressed the need for ethical responsibility when dealing with any notions of new, historically-unprecedented natures. Higgs was followed by Alexander Felson, ASLA, Yale University. Felson, who is both a landscape architect and an ecologist, spoke to the challenges and opportunities facing restoration ecologists dealing with urban ecological systems. Felson emphasized the need for ecologists to expand beyond their field, bridging theory and practice. This involves considering difficult questions regarding how we define nature and what we want out of nature. For instance, is an ecosystem restored to a historical baseline always doing as much good as one designed purely for ecosystem services? 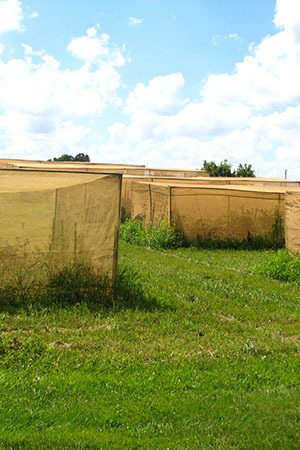 He described the need for ecologists to engage in designed experiments within urban ecological systems in order to generate data (the image above is an example of Felson’s work in this area). By integrating experimental research with design projects, we may begin to answer questions about the role of designed ecosystems in sustainable urban design. Joy Zedler, University of Wisconsin – Madison, concluded the session by exploring how restoration might work in the face of an uncertain future, considering the challenges of climate change, extreme weather events, new hydrological conditions, nutrient loading, and invasive species. Zedler acknowledged that many attempts to restore to a historical precedent, or “turning back the clock,” fall short. Furthermore, this notion of total restoration is becoming even more impractical as we lose pristine reference ecosystems and the ability to quantify ecosystem services. Still, Zedler stressed that historical precedence should remain the primary guiding influence for ecological restoration, but should not be used as an absolute template. Instead, restoration targets should be flexible and dynamic, and all restoration projects should be treated as experiments to generate new data. By taking an improvisational approach, continually testing alternative restoration methods and evaluating their effectiveness, we can embrace uncertainty and learn while restoring. Late this summer, I embarked on a journey with several classmates from Washington University in St. Louis along with landscape architecture professor Jesse Vogler. Our field-based seminar took me across the Midwest, investigating our industrial food production system. As a group of landscape architects, we wanted to see and understand this productive landscape as it is, and learn to read and identify the visible and less-visible elements that relate to food. We met with organizations and companies in the field, hoping to understand their points of view. The design of the Midwestern landscape is a marvel, the accumulation of historical and technological infrastructure that has transformed a vast expanse of earth into a machine of production. What was so powerful about my experience was seeing this so broadly. Among the people and institutions we met along our journey I observed a relentless ambition to solve problems with this machine related to land and water use, pollution, and a loss of biodiversity. There was a humane impulse to temper the momentum towards further development. Innovation has been central to the expansion of agriculture in the United States. But moving forward, innovation can’t just be about increasing crop yield, it also has to be about promoting the goals of social and ecological sustainability. In confronting the Midwestern agricultural machine, we must ask: is there a way to create an engine of innovation productive on a large scale but also informed by a deep sense of ethics? The field of “social innovation,” which has been explored by Stanford Social Innovation Review, offers thinking that may help, explaining how productive landscapes can be sources of positive change if “social entrepreneurs” are able to act. The language of social entrepreneurs is also increasingly useful in speaking to leaders across non-profit, business, and government sectors about environmental, social, and economic justice issues. Innovation for social good often comes about because the market has failed to provide a solution. Many non-profit institutions we visited focused on what the local agricultural markets won’t deal with because they can’t make any money doing it. 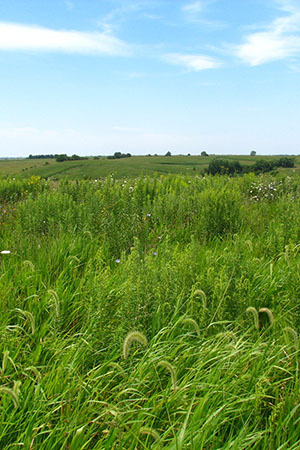 For example, The Nature Conservancy is an organization that manages prairie restoration on the Great River grasslands and buys easements on surrounding properties in order to conserve them. The Land Institute is research center developing a perennial agriculture system that will take decades to market its first profitable crops. Harvest Public Media is a radio production that fills a critical information void, covering issues of food, fuel, and field from the Midwest. Each of these institutions commit to a mission that the market doesn’t support. On the other side of the spectrum, we also visited companies and organizations like Monsanto, John Deere, and the Chicago Board of Trade, which have been major players in shaping the productive landscape. These firms create market innovations that offer new opportunities in emerging markets. These institutions have the power of scale. They are effective at riding the market wave over the long term. Even within the profit-centered framework of a traditional corporation, companies like Monsanto and John Deere have the opportunity to do good through sustainability initiatives. They can drive profits by identifying new business opportunities that also happen to address shared value or responsible corporate citizenship. Social entrepreneurship is really about creating institutions that bridge the gap between purely social or environmental and the market-oriented. Of the institutions we visited, there were several that blur the lines by combining a positive mission with a creative business model that reduces dependence on inconsistent funding sources like donations and grants. The Leopold Center for Sustainable Agriculture is a public institution housed within Iowa State University, but it’s funded entirely by appropriated fees on nitrogen fertilizer and pesticides. Another example is the Seed Savers Exchange, which is partially funded by the production and sale of seeds through widely available catalogs. Institutions like these offer the possibility that what is now excluded from the market system may one day become included, making the system as a whole more sustainable. Industrial agriculture, as a for-profit system food production system, is the force stocking our grocery stores, satisfying the increasingly high-protein diet of the developing world, meeting the demands of population growth. But it’s also spurring rural-to-urban migration, using much of our fresh water, and creating pollution. A more sustainable agriculture system must understand anew the relationship between cities and the productive landscapes in their region. The spread of urban gardens in landscape architecture design work has inspired the public to imagine how small scale, bottom-up interventions can advance sustainability, but without integration into a larger system, these gardens will not be effective in challenging the industrial food system. Furthermore, the urban farming model has largely fallen short because it doesn’t acknowledge our diet is based primarily on grains rather than vegetables. We must acknowledge the successes of the industrial system, but then also make room for social entrepreneurs that seek more environmentally and socially-sensitive solutions. These actors can set new standards and truly change the way that companies, organizations, and even governments operate. Market, social, and environmental innovation must be viewed as symbiotic. This guest post is by Ylan Vo, Master’s of Landscape Architecture and Architecture candidate, Washington University in St. Louis. Today, the High Line can be considered “the most important new model for public space in our time. It redefines public space.” This is because the park enables visitors to “look at the city instead of escaping from it.” It’s so impressive, Goldberger said, that “no one thinks of its distant resemblance to Promenade Plantee in Paris, the original French railroad park; the High Line is far more urbane and contemporary.” The High Line is not just a tourist trap either. “It’s immediately become part of the DNA of New York City,” with more than 5 million visitors per year, mostly from other parts of the city. 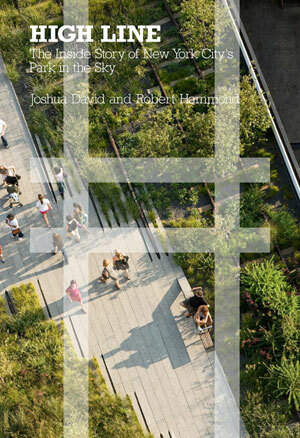 The story of how the High Line came to be is a long and fascinating one, relayed by David and Hammond in their excellent book, The High Line: The Inside Story of New York City’s Park in the Sky. In their remarks, they went through key highlights in the park’s history, explaining how they created the non-profit group Friends of the High Line, created their cool “H” logo for the park, took some wonderful photography of the space to build support for it, and eventually sued Mayor Rudy Guiliani to prevent its destruction (which would have cost some $50 million alone). And that was just in the first few years. They launched an ideas competition that brought in hundreds of entries from around the world. They went on to win the backing of NYC Planning Chief Amanda Burden and then Mayor Michael Bloomberg along with countless other local politicians by creating a smart preservation, design, and economic case rooted in the realities of New York City’s real estate market. They then got an innovative zoning area created so that air rights above the High Line could be moved to spots neighboring the park, although one result of this has been all the new, tall buildings that changed the character of the area. David explained how the High Line was the result of multiple sets of competing forces: “real estate, politics, and money” and then “community, preservation, and design.” He said the “friction between these forces really created this unique place.” And as Hammond noted, there was also a lot of friction between the two founders. While both are well-educated gay men, they have very different talents and personalities and often disagreed about fundamental direction of the project and design decisions. However, they eventually seemed to work through these conflicts, forge an even deeper partnership, raising hundreds of millions together to finance the work of design team they selected made up landscape architects James Corner Field Operations, planting designer Piet Oudolf, and architects Diller, Scofidio + Renfro. For the future, David and Hammond are really worried about maintenance. Each year, the High Line needs to raise $5 million to keep the park looking great. There are tons of operational challenges. “Keeping the garbage cans empty is a full-time job alone.” Hammond said “what keeps me up at night is how do we raise money for this year after year.” Their goal is to eventually get to a point where one-third of their budget is financed by fundraising, one-third is earned income, and one-third is from an endowment. Earned income may start coming from events and a new restaurant the High Line is opening. They want the endowment to reach $50 million by the end of the decade.